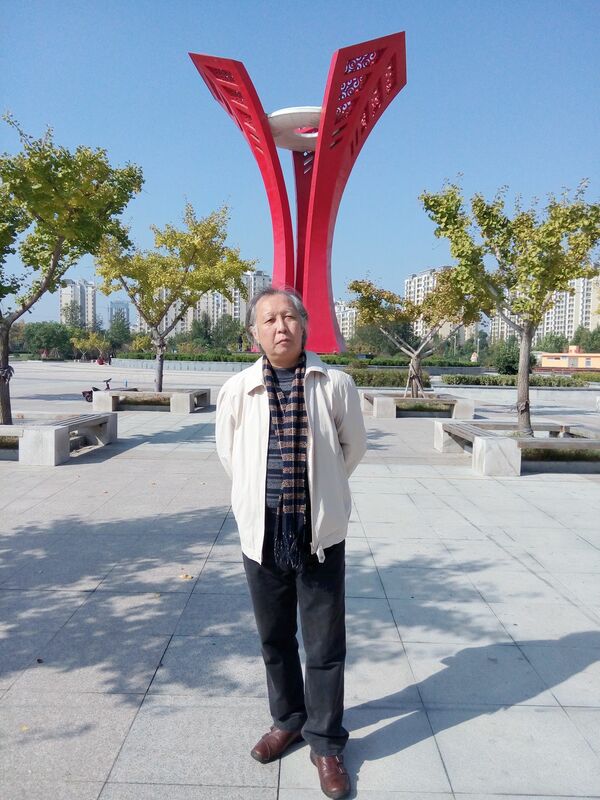 Hongri Yuan, born in China in 1962, is a poet and philosopher interested particularly in creation. Representative works include Platinum City, Gold City, Golden Paradise, Gold Sun and Golden Giant. His poetry has been published in the UK, USA, India, New Zealand, Canada and Nigeria. Who is sitting in the heaven and staring at me? Who is sitting in the golden palace of tomorrow? To build the city of gold. And carried in a book of gold. Came towards me from the clouds. Surrounded with the crystals garden. Dragons and phoenixes were flying. Standing in the purple-red clouds. There was a golden sun over his head. Surrounded with the purple-gold flames all over his body. Wafted up from the golden palace. Roaming in a golden garden. He opened an ancient sword casket. A dimly glowing purplish-red pattern. It was a sacred sword of the sun. To fly towards a new golden paradise. Impressively in front of my eyes. Were much taller than the mountains. With smiles in the grand palace. made the person suddenly forget all time. that created the holy kingdoms of heaven. Landed on the millions of planets in the universe. Make the gold bloom flowers. Turn into their imagination works. and built the platinum cities. Rotating like coloured lightning in the sky. Sending out quietly the brilliant white light. Came and went leisurely in the street. Both men and women looked beautiful. Spaceship flying around silently in the sky. There were also a row of unusual instruments. Some of them were talking with each other, softly. And there also, were crystal gardens. The blinking books of gold were in their hands. Carved with all kinds of wonderful pictures. which was as peerless as a sculpture. they were recounting the civilization of the universe. And the clay was a layer of transparent golden sand. And the heaven and the earth shone as bright as the crystal. birds were flying in the sky. And any moving vehicle could not been seen. Covered with lightning feathers all over their bodies. A colourful halo shone around their bodies. And moved towards a space of golden light. A multi-coloured city of crystal. There hung the singing golden bells. Lined with the golden trees. And their bodies reflected a shining halo. Some were summoning the birds in the sky. Filling the whole majestic main hall. A huge book was in his hand. where the smiling giants sat. as if they were intonating the inspiring poems. Floating in the golden transparent sky. Where the propitious clouds were blossoming. the golden sun was rotating on his forehead. The up-down four-direction were the lights of pure gold. shining the layers of purple-gold light. And there were also trees of light. the beasts were like some aerial phantoms. brilliant and fascinating in his bones. waved to me and smiled. What I saw was better than heaven. and created the countless worlds of gold. and the words created the time of gold. It was all of the wonderful worlds. He told me that it was another universe. and said it would be my future guide. Lightly flew to the distant outer space. This entry was posted in Blog Posts, Poetry Drawer by Deborah Edgeley. Bookmark the permalink.